CPI Keystore Monitor allows a tenant administrator to manage the tenant keystore and its entries. A keystore contains entries uniquely identified by an alias where each entry has its own lifecycle. Renewal of an entry is important task to be done before expiry, else it will lead to message failure for productive scenarios using specific certificates/key-pairs entries. The tenant administrator can be notified for those entries which are about to expire, so that he can take in-time actions for renewal of the same. Within keystore monitor, expired keys and certificates are highlighted showing expiration date. In addition, an Integration Flow can be modeled to get notifications via mail for entries reaching their expiry. This document provides steps to model a scenario triggered via scheduler which looks across all entries of the tenant keystore and sends a mail with information about those entries reaching their expiry. Make sure the Page Size field value is null since entries in a keystore are not so many in numbers. The response of the OData call will be a file containing all keystore entries with their Alias & Validity date. Now add a General Splitter step to split using XPath /KeystoreEntries/KeystoreEntry and pass split entries to a Local Integration Process. 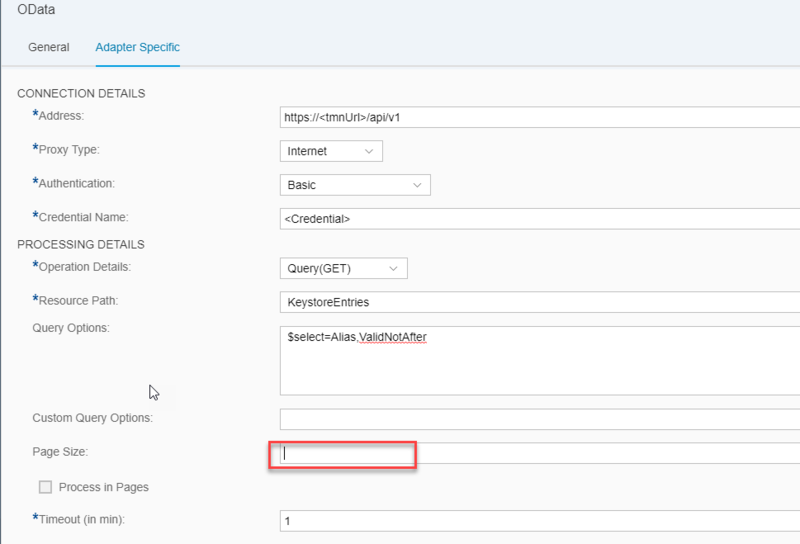 In Local Integration Process, define a Content Modifier and store the values of keystore entry Alias and Validity Time in a header. Additionally, add a message containing Alias & Validity Time information about keystore entry in body of Content Modifier. This message will be send via mail notification. You can choose to customize this information as per your need. Add a router step to route those entries whose expiry is in less than defined number of days (e.g. daysToExpire < 4) and send an email to specific participants informing them about the expiry.